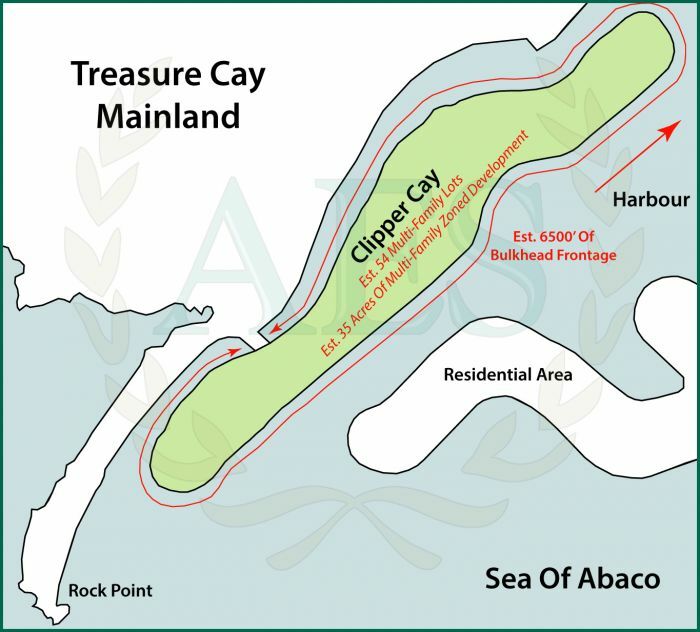 A wonderful opportunity for investment awaits with Clipper Cay! Boasting an estimated 35 acres of multi-family zoned development property that offers an estimated 6,500 feet of bulkhead frontage on Treasure Cay Harbour, this is a strategically important location within the resort community of Treasure Cay, Abaco, Bahamas. This location represents an ideal position for the construction of further dockage within the Treasure Cay community representing a large amount of deep water sheltered frontage within the safety of Treasure Cay Harbour. Furthermore, the area represents the only entrance for water vessels into the Treasure Cay Marina. With approximately 35 acres of property, there is potential for an additional 54 multi-family zoned residential lots to be created and marketed on the real estate market offering a great amount of sheltered water frontage, in addition to being in close proximity of all major resort amenities. This is a once in a lifetime investment opportunity, it is yours to seize while it lasts. Call today to secure your investment on the world renowned Treasure Cay Beach and build your vision for your own beachfront hotel located within the tropical paradise of The Bahamas. This listing has been viewed 42 times.